One of the interpretive panels outside says this about the depot. 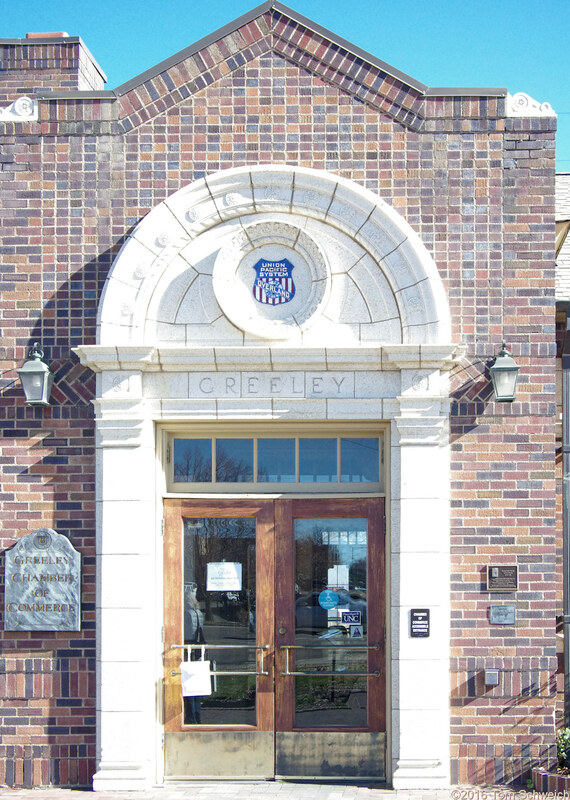 The Greeley Union Pacific Railroad Depot was designed by architect Gilbert Stanley Underwood and built in 1930. During the dedication ceremony, Union Pacific President Carl Gray said, "There is not much economic justification for the building of this station… This expenditure shows in a measure the appreciation of the railroad for the cooperation and aid this community has given the Union Pacific." The building features terra cotta trim on the four main entrances and grouped, central double-hung windows on the east and west elevations. Inside, stenciled folk art images of animals and designs decorate the ceiling beams. The building was listed on the National Register of Historic Places in 1993. Greeley's link to the outside world was through a series of four depots. During the city's first year, passengers made do with a boxcar as a depot. In 1871, a modest board and batten tructure greeted distinguished visitors such as Horace Greeley and P.T. Barnum. In 1883, a stone depot was built near the site of the current depot. Finally, the existing structure was built in 1930 as a result of the efforts of many Greeley residents, including Chamber of Commerce president Thomas Welsh, who believed that transportation "is and always has been the dominant factor in city growth."